3/2-way solenoid valves have three ports and two positions. For oil or fuel (petrol, diesel) , a brass housing is recommended in combination with seals made of FKM rubber. 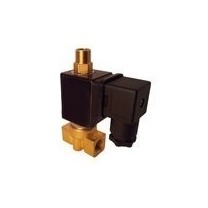 Direct acting solenoid valves operate from 0 bar and are suitable for small flow rates (typical orifice 1-3mm). For larger flow rates, a 3-way ball valve is more suitable. There are several circuit functions possible, such as normally closed, normally open, divergent and universal.